After successful completion of Orillia hydro power plant and other government bridge repair project, the Ace Landscape Construction is now taking new commercial and government concrete projects. With our proven quality of service, work reliability and top of the line equipments, no doubt Ace Landscape Construction is one of the first choice for Canada’s top government contractors. 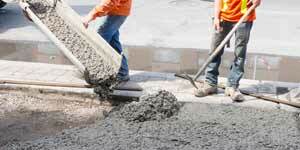 Ace Landscape Construction concrete crack repair is one of the top notch services we provide. Our well experienced crew examine the site and take proper measures to ensure the depth and impact of the crack on concrete strength. We use high quality sealers and insulators to stop further expansion of cracks and fully ensure the strength of concrete structure remains same as before. Ace Landscape Construction also provides removal of damaged concrete slabs and surfaces. We have well experienced and licensed crew to remove the damaged surface with right equipments. At Ace Landscape Construction we take special care of project deadline and always complete our work on time. Ace Landscape Construction also provides concrete pouring and slab building services. We provide custom slab and concrete structure building services which is performed by our experienced crew. All of our concrete poured slabs are well finished and meet all the commercial standard requirements.